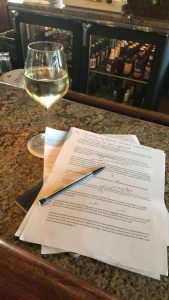 Last week, my doctor entered the room where I was waiting on her, to find me with a legal pad perched on my knee, frantically scribbling down an idea before I lost it. “Are you creating in here?” she asked with a broad smile. “I don’t have control over when it hits me,” was my exasperated reply. A few days later at a recheck visit, she seemed disappointed to find me reading instead of writing while I waited “So when you write, you actually write?” she asked while miming writing on one hand with the other. “Oh yes,” I replied as I showed her the notes and lists stuffed in my purse. Most people find this impressive, as if I’m displaying some fine tuned skill. Maybe I am? Not too long ago, my 12 year old niece was in my home office. I wrestled with a pile of legal pads on the ottoman that stores my board games. “That’s my book I’m writing,” I told her, as I plopped them back down. Although I will admit I’ve generated more than a few chuckles from young receptionists when they witness me pull a 8″ X 10″ paper planner from my bag when it’s time to schedule my next appointment. I’ve tried using my phone as a calendar and It doesn’t work for me. I need to have things in front of me and I need to be able to write on them. 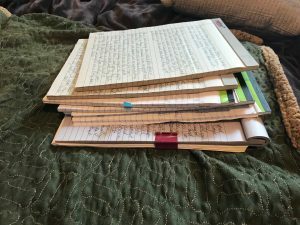 It’s not that I’ve made an active choice to write by hand as opposed to creating at a computer, it’s simply how I’m wired. I do type my work eventually. I like to write on a topic until I’ve exhausted it. Then I’ll type everything up as is, edit by hand, write additional notes by hand, then take it back to the lap top for another typing and printing. 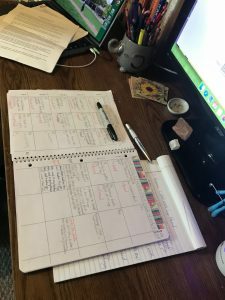 While having it all spread in front of me may look like a mess, it’s actually much easier for me to stay organized when I can visualize all the documents I’m currently working with. While my methods seem old fashioned to my niece and some of the other writers I know, I don’t feel any pressure to change my process. 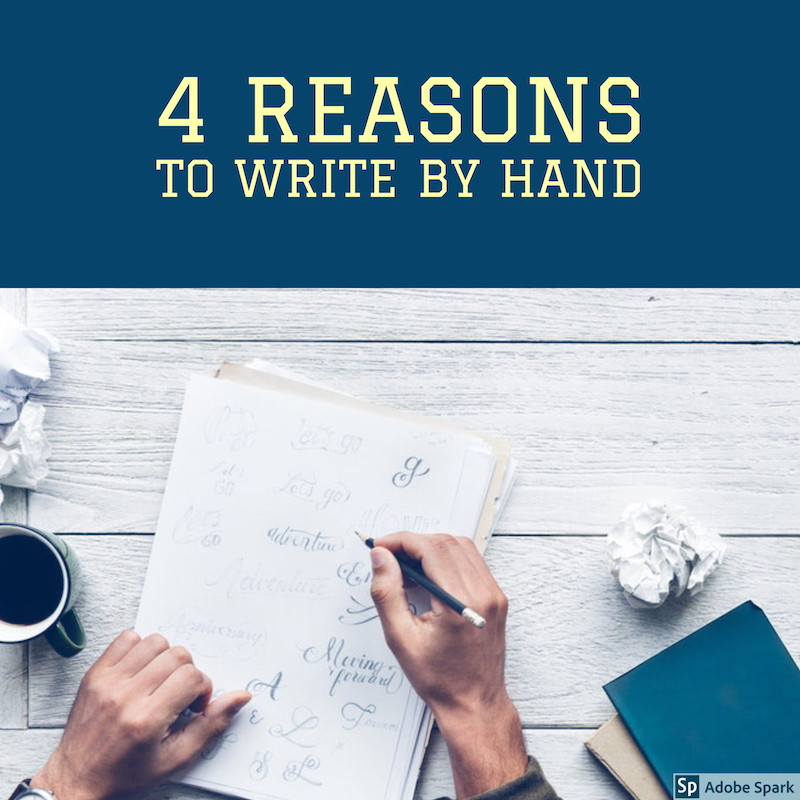 In fact, there are a bunch of benefits to writing by hand AND plenty of greats in the world of writing who still choose the “old fashioned” way. 1. Seeing my handwriting makes my work feel like a part of myself. This likely has to do with the often emotional and personal nature of my writing. When I type my essays and print them out, they seem to lose part of their power. 2. It feels good physically. The act of writing, holding the pen, feeling it scratch on the paper, all of that is enjoyable. There’s also evidence that writing by hand engages your brain in ways that using a keyboard literally cannot. Writing requires more motor skills than typing and utilizes what’s called the “reading circuit” in the brain. 3. Pens and notebooks are part of my creative process. I love having a preferred brand and style of pen, and picking out new notebooks for different purposes. It’s all an extension of my work and of myself. 4. I value having the physical evidence of my work to hold on to. I have Rubbermaid tubs full of my old notebooks and journals going back almost 20 years. I don’t re-read them, but I created them and appreciate having that with me through the years. There may come a day where I transition from handwriting, but it won’t be soon. What I hope for is technology to evolve so that I could write by hand and then a program would transfer it to text to eliminate me having to type it! Which is your preferred method of writing and why? I like handwriting and I like typing on a computer, depending on what I’m writing. 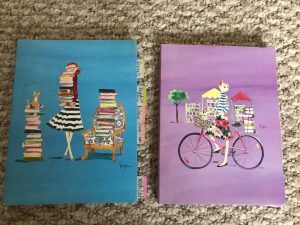 I prefer to journal in a lovely book and I like to write and draw in my visual journal. When I write a newspaper article, I prefer to type because editing is much easier. I used to be like you, Ramona, but I had to train myself to type rather than write when I was on a lot of committees, and for report writing. I did actually buy a special pen once that transferred my scribbled notes to text. It came with special note paper that was kind of interactive. The other end of the pen had a USB ‘thingy’ (for lack of a more technical term) that plugged into a computer and uploaded the writing as text, using specific software. They’ve been around for a long time, so I’m sure they’d be even more sophisticated now. I barely write anything now. Maybe there is a happy medium between hand-writing and typing? Great blog!